My sister is a keen student of nature, so on returning from a long walk, looking flushed and healthy, she starts telling me about everything she's seen in the trees, flowers and fields, not far from the house we both grew up in. My attention wanders after a while, so I ask a question intended to demonstrate my interest that has exactly the opposite effect. "I told you that already," she says, with some asperity and I have to admit it's a refrain I'm hearing from lots of people these days. First signs of a failing memory, perhaps. But I have a better theory. My brain has learned to filter key ideas from conversational noise. "You can't expect me to register every word you say," I explain, while carelessly turning to look out the window at the dreich, autumnal morning. "A lot of it is stream of consciousness dr ..."
A slight alteration of the atmosphere in the room behind me, imperceptible to anyone less sensitive than myself, stops my mouth from landing the rest of me in a deep, dark hole with alligators in it. As it is, I'm hanging over the pit by my fingertips. "What?" my sister hisses, which isn't easy with a word that has no sibilants. "Stream of consciousness? You cheeky bugger!" "Highly regarded literary device," I back-pedal furiously. "Joyce and Faulkner were exponents. Also Virginia Woolf, although some say 'interior monologue' is a better term for most of her work." "Really?" Helen addresses my back, while my front hunkers down in fear and alarm. "And what about dr...? That was going to be dross, wasn't it? Or even drivel!" "Certainly not," I say. "Neither of those." "What was it then?" she says. "I can't think of any other words." "It could have been loads of them," I tell her. "There are hundreds of words in English that start with 'dr...': Dragons. Dreadlocks. Dragonflies. Dromedaries. Drumsticks. Drupaceous." "There's no such word as drupaceous," she interrupts. "There is," I tell her with relief, as the way out of the hole reveals itself to me in all its elegant perfection. As a poet Helen is fascinated by words. "What does it mean then?" she says. "Not having all the properties of a drupe, but very close," I say, and she raises an imperious eyebrow so I hurry on. "A drupe is a fleshy fruit with a hard stone surrounding a seed." "Like peaches and plums?" she says. "Also nectarines, apricots, cherries and olives," I say. "And almonds." "Almonds are nuts," she says. "Technically no," I tell her. "They're the seeds of a drupe. Walnuts, pecans and pistachio nuts aren't nuts either. 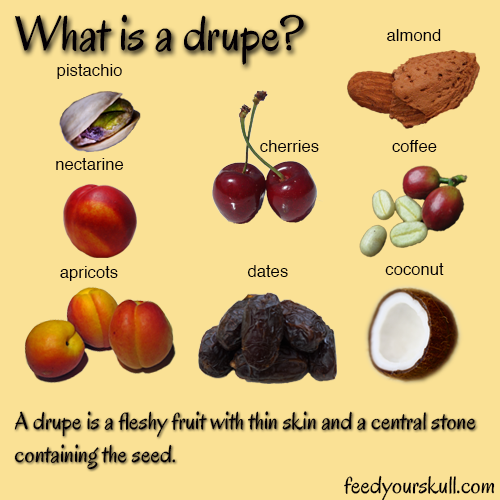 Some people say they're drupes. Others spot small differences and say they're ..."
"Correct. Not having all the properties of a drupe, but very close." "Hmm," she says. "That was an interesting but deviously irrelevant diversion. You still haven't come up with a plausible word that starts with dr and isn't drivel or something equally offensive." "Yes I have," I tell her. "I was going to say 'stream of consciousness drupaciousness'." "No you weren't," she says. "Because that is drivel." "It's a metaphor," I tell her. "It's the quality of having flesh on the outside, then a hard stone you have to penetrate to get to the seed inside - that kernel of truth, interest and originality in all your conversation." I give her my frank, manly expression that oozes sincerity. She doesn't buy it. Never has, come to think of it. "If I wasn't too refined and feminine," she says, raising her right leg and swinging the sturdy hiking boot on the end of it in a menacing manner, "I would show you the best way to penetrate a hard stone to get to the seed inside." I'm glad - on both counts!